Have you every been to a location 100's of times and yet you never get tired of the location. Someplace where you often wish you had moved there years ago? Someplace where you know the winters would get you down but the other seasons would be amazing. 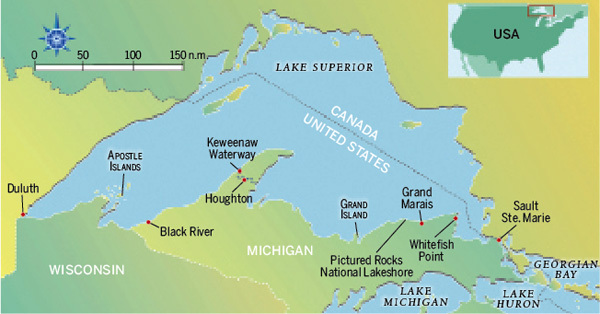 That place to me is the Upper Peninsula of Michigan on Lake Superior. Lake Superior to me is a magical lake. I have seen her WILD and CALM like glass. I call the lake a HER because I know in my heart she has the spirit of a strong powerful woman. At 64 years of age I plan to continue to explore the area and just maybe one day I will spend many days hiking and exploring Isle Royale. The Anishinabe tell of the great underwater lynx like creature who lives in the depths of Gitchigumi - the creature called Mishi Peshu or Mishipashoo. He is the ulitmate metaphor representing the power, mystery and innate danger that comes from these sacred waters. With razor like spikes on his back, the face of a lynx or panther, and the body of a sea serpent, this creature demanded respect. The Anishinabe offered tobacco and prayer to the creature spirit before they embarked out onto the waters in their canoes. The calm waters of Lake Superior can be quickly transformed into raging squalls and huge waves from the northern, north-eastern, and north-western gales that often suddenly crop up. These gales sweep over the open water, quickly picking up momentum and causing huge waves, some up to 40 feet high. Pictographs of Mishi Peshu can be found in several areas around the Great Lakes. The one in the picture to the right is found at Agawa Bay, Lake Superior National Park, in northern Ontario, north of Sault Ste. Marie. The Midewiwin Society claimed in 1850 that this pictograph was painted by an Anishinabe shaman, and represents a heroic 4 day crossing of Lake Superior by a war party of five canoes. The author is believed to be a tribal shaman named Myeengun which means "Wolf." The images are painted using red ochre, a pigment made from the iron ore called hematite, mixed with clay minerals. This is the most famous rock art painting in Canada, according to National Collection Archive sources. On an island just outside Thunder Bay, now known as "Isle Royale", there lived a great tribe of Ojibwe Natives. Because of their loyalty to the Great Spirit, and their peaceful and industrious mode of living, Nanabijou, the Spirit of the Deep Sea Water, decided to reward them. One day he called their Chief to his great Thunder Temple on the mountain and warned him that if he told the secret to the white man, that he, Nanabijou would be turned to stone. The Chief gave his promise, and Nanabijou told him of the rich silver mine, now known as "Silver Islet". The Great Spirit told him to go to the highest point on Thunder Cape, and here he would find the entrance to a tunnel that would lead him to the centre of the mine. Apparently the Chief and his people found the mine, for the Ojibwe became famous for their beautiful silver ornaments. So beautiful indeed were they, that the Sioux warriors on seeing them upon their wounded enemies, strove to wrest their secret from them. However, torture and even death failed to make the gallant Ojibwe divulge their secret and the Sioux chieftains had to devise another scheme to find the source of the Ojibwe silver. One day they summoned their most cunning scout to a pow-wow and a plan was formed. The scout was to enter the Ojibwe camp disguised as one of them. This he did and in a few days succeeded in learning the secret of the island of silver. Going to the mine at night he took several large pieces of the precious metal in order to prove to his chieftain that he had fulfilled his mission. The scout however never returned to his camp, for on his way back he stopped at a white traders post to purchase some food. Having no furs or money with which to pay for the goods, he used a piece of the silver. Seeing such a large piece of the gleaming metal, two white men sought to obtain the whereabouts of its source, in order to make themselves fabulously rich. After filling the Sioux scout with alcohol they persuaded him to show them the to the mine. When almost in sight of "Silver Islet" a terrific storm broke over the Cape. The white men were drowned and the Sioux man was found in a crazed condition floating aimlessly in his canoe, but the most extraordinary thing that had happened during the storm, was that where once was a wide opening to the bay, now lay what appeared to be a great sleeping figure of a man. The Great Spirit's warning had been fulfilled and he had been turned to stone. On a little island at the foot of the Sleeping Giant, can still be seen the partly submerged shafts of what was once the richest silver mine in the northwest.